The ANNUAL MEETING in April is always a time to reflect on the past and look forward to the coming year. Outgoing President Gill was thanked for her total commitment, enthusiasm and leadership with particular reference to her concentration on ‘all things Bilston’. Members have enjoyed a good year of fun and friendship, whilst helping many people. Incoming President Jenny received the chain of office stating that her chosen charity is The Samaritans with Mental Health being at the fore front. She is looking forward to an enjoyable year. Other senior officers appointed included Barbara as President Elect and Cherril as Vice President. To mark her 50th wedding anniversary to Roger, Ann had brought wine which made the meeting flow! Thanks and Congratulations Ann & Roger. I am very thrilled to become club President for 2019/2020. I look forward to continuing our busy P.A. activities together with an increased awareness of mental health issues. With our committed and hard working membership I hope that we may make a difference to those less fortunate than ourselves. Past Presidents Ann & Jan, welcome incoming president Gill (in centre). The Club AGM was held at the April Business meeting at which President Ann reviewed with enthusiasm her time in office. Other officers presented their reports, all thanking Jan & Ann for their leadership and wishing Gill every success in her year. This was followed by the induction of Gill as President by Ann and the presentation of Past Presidents Badges. 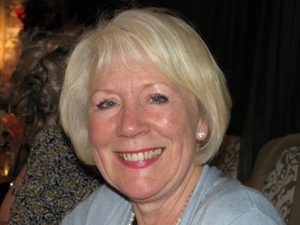 Gill’s theme for the 75th club year is “Involvement brings enjoyment and achieves” a year during which she hopes members will continue to make a difference to others less fortunate than ourselves and enjoy friendship and fun. Ann takes over as President. The Annual Charter Celebration this year was a cocktail party followed by a buffet. Excellent entertainment was provided by K-Lo a versatile personality vocalist who really created a party mood and encouraged lots of people to get up and dance. Towards the end of the evening Regional Presidents Pat & Cherril inducted our new president Ann who takes over from Jan to complete the year. At the AGM in April 2917 the office of President for the forthcoming year is to be shared by Jan & Ann .